The first thing you ask yourself before starting to write a new computer program is; "Has it already been done?" Well today we decided to throw that guideline out the window and rewrite a classic arcade game that has been redone ad nauseum! However this version is different than the original. The bricks at the top of the screen move around. Some of them have powerups inside of them, for example a freezing brick will stop all the bricks from moving, a magnetic brick will cause the ball to be attracted to your paddle. Also, in the original breakout you have a limited number of paddles (extra lives). 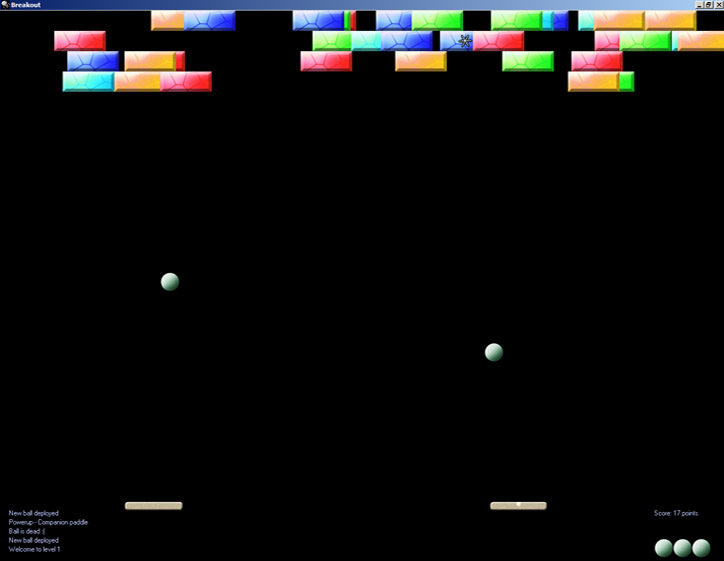 In this version your extra lives are in balls. By clicking you can choose to deploy more of your spare balls at any time even while another one is in play, thus you will have 2 or more balls to juggle.